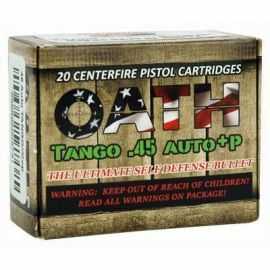 The OATH Corporation is a company founded on the sole principle of providing a better bullet for military, law enforcement, and shooters everywhere. They pride themselves in manufacturing the finest, precision machined, lead free performance bullets in the world. Their manufacturing process starts at the component level and they use only the highest quality materials. OATH Ammo features precision machined projectiles with consistent impact behavior and superior accuracy. The entire Tango line consists of all precision machined Lead Free defense rounds that deliver the most reliable and unique penetration characteristics of any special purpose ammunition. The Tango series is the first defense projectile that delivers optimal energy transfer upon penetration.